NYFW week may be over, but the Spring and Summer collections continue to be shown around the world, and most recently in Milan where Ermanno Scervino debuted his SS13 collection. With flawless faced models and perfectly coifed hair by Gabriele Trezzi for Moroccanoil, the collection spoke numbers with the bold colors and vibrant shapes. Gabriele's inspiration for hair started with the desire to have an "Elegant and refined style that could transmit true grit and modernity". With his fantasy taking him back to the legendary glamourous and feminine times in the 60's but revisited with a fresh, contemporary note with movement. Rigorous at the front, the hair was gathered softly at the back in to a low ponytail with a slight touch of volume on top of the head and then tied at the nape of the neck in a very special slip knot. The finished look absolutely evokes Tezzi's inspiration and I predict seeing the style in the near future on the red carpet and a la us bloggers. 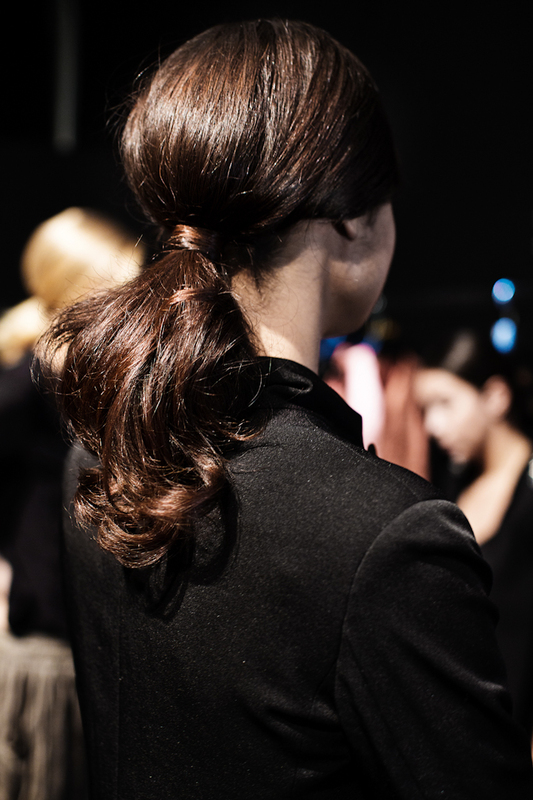 LOVE those slightly messy but neat/tidy ponytails! I love the slickness of their hair, they look wonderful!